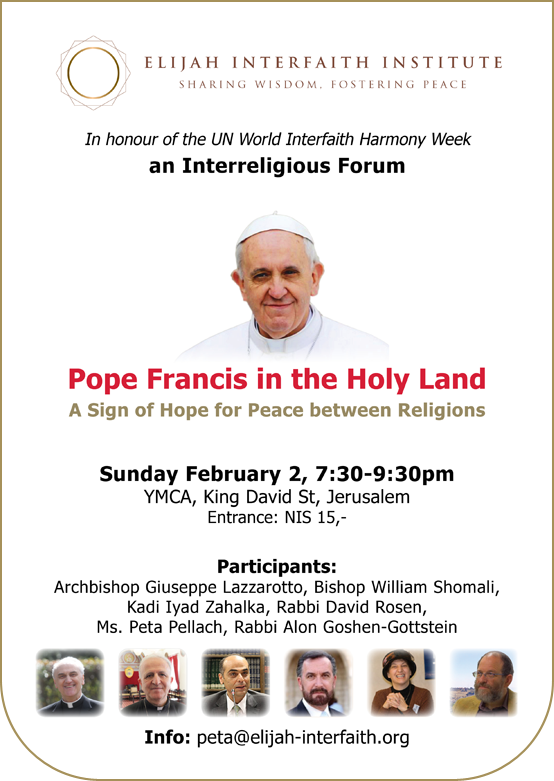 The Elijah Interfaith Institute is conducting a forum on Sunday night, 2nd February, to discuss the possibility that the Pope’s forthcoming visit to the Holy Land may herald a new era of understanding between the three religious communities who share it. • Why is the visit of the head of the Roman Catholic Church relevant to Jews, Muslims and other Christians? • How is this Pope different from his predecessors? Will he be able to achieve something which they could not? • Can Pope Francis provide the inspiration and leadership to heal the hostility between religions here in Jerusalem and beyond? Bishop William Shomali, Patriarchal Vicar of the Latin Patriarch of Jerusalem, Kadi Iyad Zahalka, Kadi of Jerusalem, and Rabbi David Rosen, International Director of Interreligious Affairs for the American Jewish Committee and Honorary Advisor on Interfaith Relations to the Chief Rabbinate. The event is supported by the Nuncio, Archbishop Giuseppe Lazzarotto, the Vatican’s envoy to the Holy Land and thus the most senior diplomat in Jerusalem, who will deliver his blessings. The venue is the YMCA in Jerusalem. The timing of the forum is to honour UN World Interfaith Harmony Week, the first week in February, which the Elijah Interfaith Institute marks annually. Founder and Director, Rabbi Dr Alon Goshen-Gottstein, will open and close the forum. Director of Educational Activities, Peta Jones Pellach, will moderate the discussion.